A delicious way to explore the states of matter using this two-week unit! 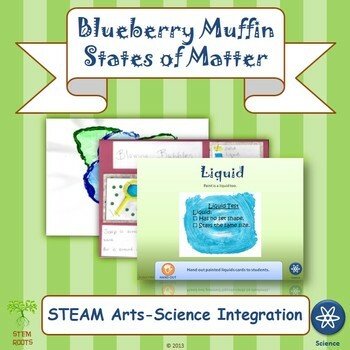 Teach your students about the states of matter surrounding a blueberry muffin theme. Through class presentations, interactive multimedia explorers and hands-on labs, students will discover the states of matter. First, they will create their own States of Matter Voting cards to use during the Solid, Solids and Liquids, and Solids, Liquids and Gas Interactive (Smartboard) Games throughout the presentation. • Solid Lab Journal Worksheet. • Blueberry Wax and Watercolor Project (for liquids). • Blowing Bubbles Scientific Diagram with writing component (for gasses). Students wrap up this lesson by creating their Heat Changes Things Thermometers by cutting and pasting their voting cards onto their worksheets. 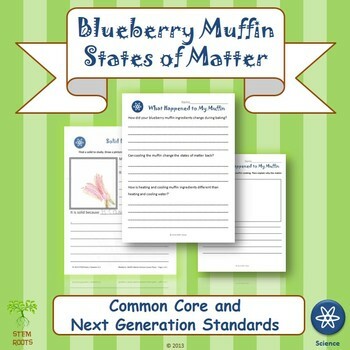 • Students conduct their own observations about the states of matter of each ingredient of blueberry muffins. • After hands-on exploration of each ingredient, they will cut and paste, paint and use a hole punch to complete their Muffin Matter Ingredients Observation lab. 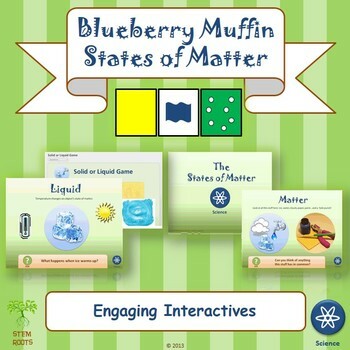 • Students will each receive a cross-section of a blueberry muffin and observe its states of matter—solid muffin, liquid blueberries and pockets of air—or gasses. • Students conclude the unit by completing the What Happened to My Muffin writing assignment to synthesize their observations about changes in the muffin’s states of matter. Cooking is not required. If your classroom does not accommodate cooking, simply bring in cooked muffins for this lesson. 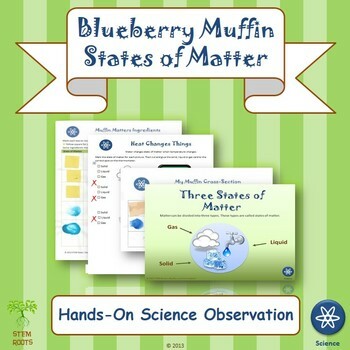 This is an excellent science addition to a blueberry literacy theme or for use with Blueberries for Sal! It can also stand alone. ★ Follow me! Click the star (★) beneath my STEM Roots store name above to be the first to know about freebies, new product listings and more! Keywords: NGSS 2-PS-1, NGSS 2-PS2-4.